Presentation given by Helga Zepp-LaRouche on the global strategic situation in front of large delegations from around the world. The New Silk Road is not only an extremely important economic initiative. Because it is a win-win perspective, it also addresses the two biggest dangers in the world today: the danger of a financial blowout of the trans-Atlantic sector and the danger of global war. I have to address the fact that if the hardline of the Troika insists that Greece should pay the debt, a debt of 360 billion euros which is completely unpayable, this will blow out the derivatives of the European and American banking system. Two days ago, the Debt Truth Commission of the Greek Parliament found the Greek debt to be illegitimate, odious, and unpayable. Now, the debt blowout can be prevented if there is a European debt conference in the tradition of the 1953 Debt Conference for Germany, which was the precondition for the economic miracle of Germany to occur. If there is a credit policy adopted in the tradition of the Kreditanstalt für Wiederaufbau [Credit Institution for Reconstruction], given the importance of its role in the reconstruction of Germany in the postwar period, this would mean going back to industrial banking in the tradition of Hermann Abs or Alfred Herrhausen, who were in the tradition of Alexander Hamilton, the founder of the American System of Economy in the United States. The German economy is key to the situation, because there are many people in Germany—including retired members of the military, industrialists, and two former Chancellors, Helmut Schmidt and Gerhard Schröder, and Foreign Minister Frank-Walter Steinmeier—who realize that the G7 has been turned into a geopolitical tool of confrontation against Russia. And they also realize, many of them, that Germany is as much a target of this geopolitical confrontation as Russia. For German industry is collapsing right now, losing 28% of its exports to Russia in the first quarter of this year. But in spite of the erosion of the German economy due to the nuclear “exit” three or four years ago, Germany still remains the economic powerhouse of Europe. And if Germany would now end the sanctions by admitting that the reason for the crisis is not Russia, but the EU itself, by pushing the EU Association Agreement, then this crisis could be overcome. Now with the upcoming summit of the European Fund for Strategic Investment on the 29th of June which China’s Premier of the State Council Li Keqiang will attend, this could become a venue to co-finance the extension of the New Silk Road to Southern Europe, and in that way address this problem. Already in 2012, the Schiller Institute produced a comprehensive program for the development of the Mediterranean Basin Great Infrastructure Projects, which would extend the New Silk Road to all of southern Europe. It was based essentially on the proposal which the EU had already agreed upon at its conference in Crete in 1994: that ten transportation corridors be built. But they were never created because of the austerity policy of the EU. This was also the subject at the big conferences in Bucharest and Belgrade which Li Keqiang attended in 2013 and 2014. If this program were to be implemented, then Greece would become the bridge between Europe and the BRICS, and build on the ancient collaboration of Greece and China, at a time when Greece was the transport hub for the ancient Silk Road, and would build on the old ties of the two great cultures of Greece and China. Now the quality and density of infrastructure is a precondition for the productivity of the economy. A modern economy should invest at least 50% of its total expenditure in infrastructure. We are not talking about connections between point A and point B, but we are talking about corridors which will consist of high-speed rail, waterways, highways, energy production and distribution, and communications, because this is what governs the conditions for optimally locating industrial production and agriculture. The purpose of these corridors is to increase the productivity of the population. The connection between the many ends of the New Silk Road in Yiwu, but also in Lianyungang and other places, to Duisburg, is one good example to show that the higher the development and productivity of an economy, the more important the speed and efficiency of transport. Because then the finished and semi-finished goods work together like a complex machine where each part functions as a part of a harmonious whole. The density of infrastructure in the Ruhr and Baden-Württemberg and in Rhein-Main should become the model for the Balkans and southern Italy and the Aegean Peninsula. To get the world out of the geostrategic confrontation with Xi Jinping’s “win-win” Silk Road policy, the integration of the German economy is absolutely crucial. For Germany presently ranks as number four in the number of registered patents in the world; and this with a population of only 80 million people. And the high ratio of the so-called Mittelstand, mid-level German industries, which are largely innovation-based firms using essential machine tools and machine-tool designs, is crucial for bringing the world out of its present crisis. The Schiller Institute has produced a study of 370 pages entitled “The New Silk Road Becomes the World Land-Bridge,” which is essentially an outline for the next decade of how to overcome the underdevelopment of large areas of the world. These are the corridors which will connect the world from the southern tip of Chile, all the way through the Americas to the Bering Strait, and then to the tip of South Africa. This would mean cooperation in the areas of high energy-flux density industries like biophysics and space exploration. This project presents limitless possibilities for a “win-win” cooperation of the whole world. The two most advanced cultures on the planet are located at opposite poles of the Eurasian continent, and that if these two poles join hands, then every region in between can be uplifted. Now this vision today is true for the whole world. Together we can create a new era in human history where the human species is able to overcome geopolitics forever, and develop its true identity as the only creative species so far known in the universe. June 26—Speaking on June 19 at the Silk Road Economic Belt Cities International Forum in Yiwu, China, Helga Zepp-LaRouche, president of the Schiller Institute, warned of the dangers facing the world of possible financial blowout and global war, and underlined the importance of the Silk Road Economic Belt, proposed by Chinese President Xi Jinping, as the way out of the crisis. 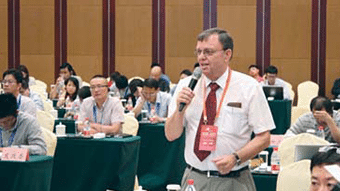 The June 18-19 forum had been organized by the Chongyang Institute of Financial Studies at Renmin University, huanqiu.com—a division of Global Times newspaper, and the Yiwu City Peoples Government. While the conference focused on Yiwu, a growing city south of Shanghai, as a hub at the end of the new train corridor between Asia and Europe, the conference organizers had brought together an impressive group of people internationally to underline the importance of this project for the world as a whole. A chaotic collapse can be prevented only if the EU and European nations agree to convene a European debt conference in the tradition of the 1953 Debt Conference for Germany, which laid the basis for the German miracle of the postwar period. She pointed to the need for a return to the policy of industrial banking of German bankers Hermann Abs and Alfred Herrhausen, who followed in the tradition of the American System of Economy of Alexander Hamilton. She noted the importance of German industrial capabilities, especially the innovative small and middle-sized firms, the Mittelstand, in bringing the world out of the financial crisis. Germany is also crucial diplomatically. If Germany were to reject the push to war emanating from the policy of the United States and NATO, there would be no war. Leading politicians in Germany, she said, realize that the sanctions are aimed against Germany as well as Russia, with German exports to Russia falling by 28% in the first quarter of this year. If Germany would now end the sanctions by admitting that the reason for the crisis is not Russia but the EU itself in its pushing the EU Association Agreement on Ukraine, then this crisis could be overcome. She referred to the comments of Gottfried Leibniz in one of his major writings on China, Novissima Sinica, that if Europe and China, those two great cultures at opposite sides of Eurasia, would come together in cooperation, all the countries in the world would benefit. Her speech, which stood out starkly from the other presentations from representatives of other European countries who were to discuss their role in the Silk Road Economic Belt, created a flurry of interest, not least of all in the new report which, as she noted in her speech, had been put out by the Schiller Institute and EIR, entitled The New Silk Road Becomes the World Land-Bridge. In introducing Zepp-LaRouche, the moderator of the panel noted that in Europe she is widely considered the initiator of the New Silk Road concept. After the forum, many people came up to talk, and to view the report. Her speech also garnered wide-spread attention by the media, with one article circulating on sina.com, an equivalent to Yahoo or Google in the U.S., translating and quoting almost all of her ten-minute speech. Many other websites and papers borrowed extensively from the sina.com article in their comments in the following days. Others noted her response in the Q&A session, where she succinctly noted the need for high-speed rail—as opposed to sea transport—since in a high-tech, high-value economy, speed of transport of goods becomes a premium. 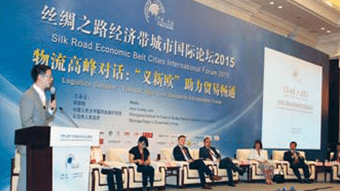 While Yiwu is only one of a number of cities in China holding conferences on the Silk Road Economic Belt in an effort to profile their importance in the project, Yiwu’s geographical location, less than one hundred miles from Ningbo, the nearest port, and at the terminal of the European rail line, served to spark more than local interest. Also, since the organizers had assembled a high-level presence at the conference—including two former prime ministers, and a former foreign minister, as well as a representative from the Foreign Affairs Committee of the National Peoples Congress, and numerous ambassadors to the Peoples Republic of China—there was considerable nationwide media attention focused on this conference. 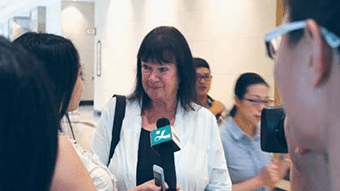 A short interview with EIR‘s Washington correspondent Bill Jones, given to the local Yiwu TV, was also aired nationally by CCTV in its coverage of the forum. While Yiwu is not a major industrial center, it has transformed itself into a major commodities port, with goods coming in from all of Southeast Asia through the port of Ningbo for shipment and transfer through Yiwu to Central Asia and Europe, over the new rail lines. So too, goods from Europe are brought by rail to the Yiwu land port before shipment by sea to other parts of the Asia-Pacific. It was clear that the organizers of the conference considered the presence of the Schiller Institute very prestigious for their event. While the ex-ministers and the ambassadors might have helped to bring added media attention to the conference, the intellectual rigor exhibited by Helga Zepp-LaRouche in her speech, really placed her in a category of her own. This was evident to all who heard her remarks, bringing a clear—and stark—note of reality to an event which otherwise might have been simply a worthwhile rally for a praiseworthy project. Her short speech and the media coverage of it, as well as the separate interviews she gave during the conference, will reverberate widely in China and beyond.